"Space ships race across the galaxy, dodging meteors and asteroids. Zap! Hit, they disintegrate, the another blasts off for another flight. Each succesful trip through space earn an individual score. Totalizer records scores for competing ships. One player can race the clock or fly two ships for a high skill test. Two players can duel through the meteor storm competing for high score." 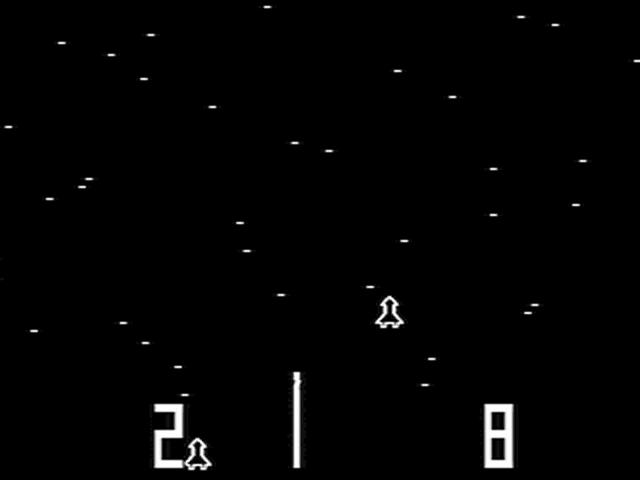 Space Race was Atari's second game after Pong. It was also licensed to Bally Midway who released their own version under "Asteroid" name. Each player controls a little space ship startinf from the bottom of the screen. The ship can be moved up and down (but not sideways) using 2-direction joysticks. The ships must pass through an asteroid field that moves horizontally across the screen. When a player reaches the top of screen, successfuly passing through the asteroid field, he scores one point. Timer counts down several minutes and whoever has the most points at the end wins. 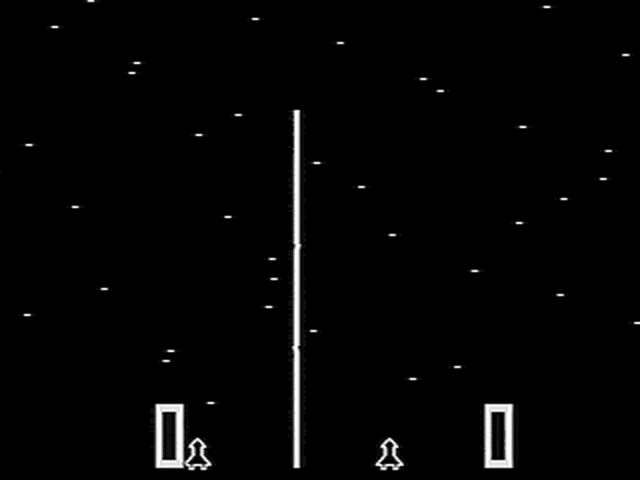 Space race is remarquable because it is an attempt to use pong-era technology to do something other than pong, as early as 1973, while pong era will still continue for some years! The game principle may be quite simple, crossing the screen while avoiding / dodging obstacles, but it led the path to a whole new genre of videogames, including Frogger, Freeway, etc.